Is it just me or does the world feel a little less kind lately? I've got something so special to share with you today! Something that I hope will lift your spirits even if only a little bit. My lovely new friend Lindsay, who worked with Hip Hip to design our library buttons made some delightful printables for me to share with you! From time to time these will be available in the Little Free Library but I'm excited to share them here too. I can't wait to see how you use these cards to spread love and light and inspire others to choose kindness. I’ve found such comfort and encouragement in hand written notes, (even post its, especially post its) cards, text messages, emails and DMs. Which makes me so happy to tell you that these will be on Instagram too. Visit @littlelightofminelibrary and find them in the highlights section. There are even some bonus ones. If you share them and care to tag me in them please do, or use the hashtag #littlelight_bekind, I’ll (re)share some of them. But wait, there's more! Because around here we know that books are not just treasures they are tools and maps; they help us to shine our lights as we love on our families and then venture out into the world and love our neighbor. Through reading we learn characteristics and qualities that make us better and in turn our communities better. Lindsay surprised me with these fabulous book recommendation cards and I do love them. In my effort to give something to you I was blessed with the sweetest surprise. This is a real life example of how this whole kindness thing works. And while we may not always get back something tangible we get other really wonderful beautiful things —like hugs, smiles, full hearts, friendship and the most rewarding feeling that comes from making a difference. I say this often because it is true — I love seeing people use their gifts and talents and share those gifts with others! A very special thank you to Lindsay for sharing her gift with Little Light of Mine Library and for making it possible for us to share it with others. 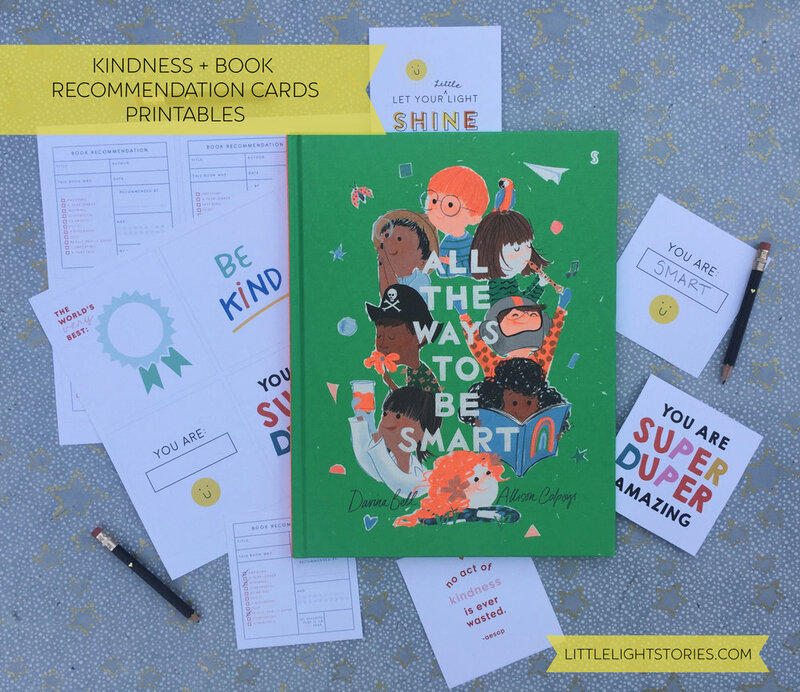 I hope these printables (and stories templates) allow you to sprinkle joy throughout your days and the days of those around you. I hope they inspire you to show and model kindness to others and to yourself. Tuck these into library books, lunch-pails, under pillows, classroom cubbies, into Little Free Libraries, mailboxes, tote bags, briefcases and luggage. Use them as gift tags, cards, and morning affirmations. Let them be reminders that redemption is real and to extend grace to yourself on the days when you are reminded that our flaws are what make us human. The fact that we seek to right our wrongs, to learn from our mistakes and strive to do things differently — that’s what makes us shine. 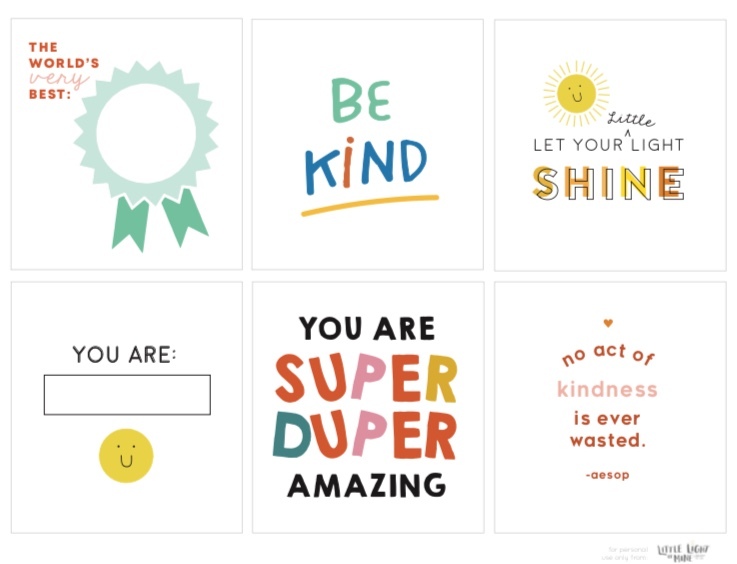 Click the link below for our kindness cards printable! Click the link below for our book recommendation cards printable! Use the book recommendation cards as motivation to “read instead”, to share stories — the ones you read and the ones you create. Share them! Please. These can help facilitate discussions about what you’ve read and maybe even how you'll apply that in your life. Above all continue to be kind. Be amazing. Know that you already are SUPER DUPER AMAZING. Get your glow on girlfriend. Boyfriend. Friend. p.s. I'm glad you're here. I’m glad that little light of yours is (still) shining.